In a small but significant victory for transgender rights, the Transgender Legal Defense and Education Fund announced Monday that it has reached an agreement with the Metropolitan Transportation Authority in New York City that allows people to use MTA public restrooms in accordance with their gender expression. 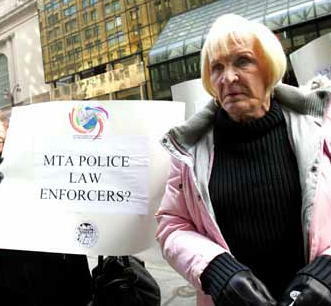 The agreement arose from a complaint filed by the TLDEF and the New York City Commission on Human Rights on behalf of Helena Stone, 70, a transgender woman who had been arrested and continually harassed by MTA police officers due to her gender identity. This is an excerpt from the blog, Transdada, posted on October 25, 2006. Helena Stone passed away earlier this past winter. Helena left a legacy: her victory for transsexual and transgender rights, and for that, she will be remembered. She also left Frick and Frack. Helena's two loving, big, orange cats, Frick and Frack, are now in need of a new permanent home. A couple from the neighborhood has been fostering these kitties for several months. I'm a hopeless cat lover, as Cass knows, and I'm breaking format at T-Central, to a certain extent, to help Frick and Frack find a good home. If you live in the area, please contact Merecedes Garcia or Miguel Fernandez at Hudson County Friends of Ferals, if you can help. I'm sure Helena's two felines have many years of love left to give.